Luncheon will follow in the Life Story Center. All who knew Robert Bailey could see that he wasn’t afraid to live life on his own terms. He was both hardheaded and softhearted at the same time, and a friend of Bob’s was a friend for life. So many of the best things in life were shared with his loved ones, and his love for his family was easy to see. Bob was known for his unwavering work ethic, and he was well respected by all who knew him. Life will never be the same without him here, but he leaves behind a brilliantly colored mosaic of memories that his loved ones will forever hold near and dear to their hearts. During the first half of the 1940s the eyes of our nation were focused overseas as WWII raged on. After the vicious attack on our naval base in Pearl Harbor, America engaged in the fight on December 8, 1941. 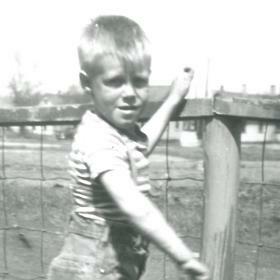 It was during this time that Ludlow and Frances Bailey were filled with great joy as they announced the birth of the baby boy they named Robert James on June 13, 1943, in Sault Ste. Marie, Michigan. The third of six children, he was raised alongside his siblings, Ann, Ludlow, Janet, Debbie, and Kenneth. Bob’s father played hockey and was also a beer distributor while his mother kept busy at home. Tragedy struck in Bob’s life with the death of his father when he was just a young boy of eight. Their family spent their summers up on Drummond Island, making priceless memories that would last a lifetime. 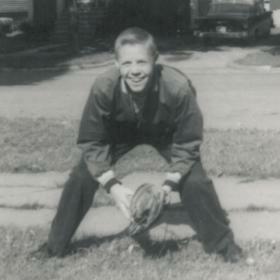 When he was 12, Bob’s mother remarried. In many ways, Bob was a young boy of his generation. He enjoyed things like playing hockey with his brothers, and he also spent lots of time fishing in the Drummond Island area with his uncles as they were very close. When he was a junior in high school, the family moved to moved to El Paso, Texas. He and his brother Ludlow later hitchhiked from Texas to Hollywood Resort Hotel in Florida. From there Bob was hired to deliver a car to Detroit, Michigan. In route, he stopped in Kalamazoo to visit his sister Ann and he never left. Throughout his life Bob was known for his strong work ethic. During his younger years he helped his uncle with the funeral home that he owned in Sault Ste. Marie. 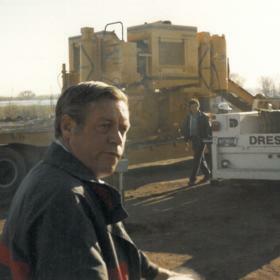 Bob later worked at Wolfe Excavating, and after 10 years he started his own business, Robert Bailey Contractor Inc, based in Kalamazoo in 1972. Bob was skilled in many areas in his work as he performed underground, site, and both large and small work in Kalamazoo, Grand Rapids and Lansing areas. He was always up for a new challenge, which was a great fit for him in business as he was good with abstract thinking. There was always lots going on with his work. Later in life he was proud to have his son, Bob, come on board in the business, and he currently has three grandsons in the business as well. He was a natural in business, and he genuinely enjoyed the people he worked with. Bob liked being behind the dozer and had an effective strategy for getting things done. He was willing to listen to his coworkers and also built several long-term relationships with customers. He was the coach, referee, and even the instigator at work at times. There was never anything of greater significance in Bob’s life than his loved ones. Bob was blessed with four children, Kimberly, Robert, Cheryl, and Denise while married to their mother, Janet Knapp. He was an active part of his children’s lives. 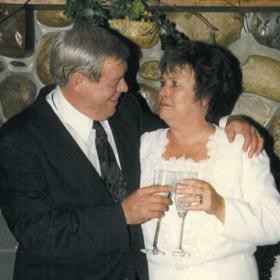 Bob was blessed to meet Patricia “Pat” Vaughn, and they were married on October 26, 1996, at Thornapple Creek Golf Course. They enjoyed spending time together and regularly golfed, fished, and ate at his favorite place, Coney Island for hot dogs. Bob and Pat liked traveling together, but their traveling time was limited until December when they would head down to Pine Island, Florida. They had the best time there every year, golfing, fishing, playing cards, and just telling stories. When he was a bit older, Bob was thrilled to become a grandfather, and he was always concerned about all of his grandchildren and interested in keeping up with what was going on in their lives. He looked forward to spending time with his grandchildren and especially looked forward to holidays. Bob loved the Fourth of July as he was very patriotic. When he was 50, he suffered his first heart attack, but he was able to recover and continued working hard. Bob was someone who lived life on his own terms and didn’t shy away from doing things his own way. Over the years Bob was a man of many interests. He liked going to auctions with his son where he bought various pieces of equipment. Bob thoroughly enjoyed having his toys. He was thrilled when his grandchildren got him his black lab, Sunday Noel, for Christmas one year. They became the best of friends, and Bob’s dog went everywhere with him including to work. Although this dog chewed up everything in the truck and office, he and Bob loved being together. Bob liked reading about the wars, particularly WWII, and he was also into reading about the history of various businesses including the rise and fall of A & P. He spent time watching documentaries and learning about how various historical figures came to be and the behind the scenes information about how they got where they are. When it came to music, Bob liked country western music. With a life that spanned times of great change in the world around him, Robert Bailey was an extraordinary man to know and love. He had the best sense of humor and was an amazing visionary who never let life get the best of him. Described as the best grandpa, Bob cherished his family and was happiest when surrounded by their love. Someone who genuinely cared about those around him, he was a blessing in the lives of so many others. Deeply loved, Bob will be forever missed. Robert James Bailey, of Kalamazoo, died peacefully on May 22, 2018, at his home. Bob’s family includes his wife, Pat Bailey; 4 children: Kimberly Bailey, Robert Bailey, Cheryl Bailey, and Denise Sluss; 10 grandchildren: Sean, Josh, Joey, Leah, James, Blaine, Grace, Garrett, Austin, Carter; great-grandson, Johan; siblings: Ann (Gerald) Montero, Debbie (Lenny) Lenhart and Kenneth Bailey and many nieces and nephews. Bob was preceded in death by his parents; brother, Ludlow Bailey; sister, Janet Hall and step-father, Al LaCourse. Cremation will take place. Visit with family and friends while sharing food and refreshments on Friday from 4-7 p.m. at the Betzler Life Story Funeral Home, 6080 Stadium Dr. Kalamazoo (269) 375-2900 where services will be held Saturday at 11 a.m. A luncheon will follow the services in the Life Story Center. 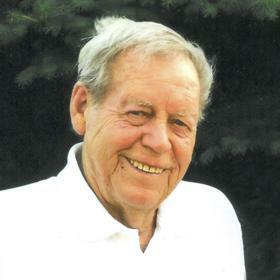 Please visit Bob’s personal web page at www.betzlerfuneralhome.com, where you can archive a favorite memory or photo and sign his online guestbook before coming to the funeral home. Memorial contributions may be made to Hospice Care of Southwest Michigan or SPCA of Southwest Michigan.